Eco-novice shares fast and healthy dinner options. I try to serve my family mostly whole grains, but the fact is that they usually take longer to prepare than their refined cousins. Brown rice, for example. I really like brown rice, but it can take nearly an hour to prepare, and sometimes I just don't have that kind of forward-thinking plan-ahead mentality about dinner. Just preparing a main dish requires most of my available brain power, and any side dishes are usually an afterthought. So here are some of our favorite kid-friendly whole grains that can be prepared in less than 20 minutes! Boil water, add couscous, take off heat and let cook with the lid on 5 minutes. Now you just have to wait for it to cool! Available at Trader Joe's and other stores. Warning: messy to clean up if your 2-year-old tosses her bowl. Delicious with sweet and savory dishes. Technically, not even a grain, and loaded with protein and other good things. Until a few years ago, no one (except my father-in-law who grew up in Ecuador) even knew what quinoa was. I first tried it after seeing it at Trader Joe's, but now usually buy it from the bulk section at Whole Foods or in 10 pound bags at Costco. 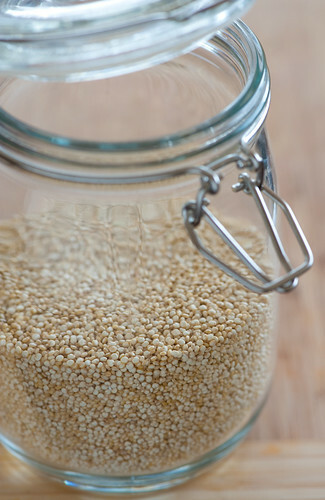 Boil water with quinoa, then simmer for 10-15 minutes. The red variety has a stronger, nuttier taste. Delicious with sweet and savory dishes, with a satisfying slightly nutty chew to it. I love it in stews too. The cooking time here varies, but almost any type will be ready in less than 15 minutes of cooking time. For absolute speed, you cannot beat Whole Food's organic whole wheat elbows. They take just 5 minutes to cook -- perfect for ravenous children at lunch time. You can also find brown rice pasta -- a nice whole grain gluten-free option (I think Trader Joe's has the cheapest prices for this). What is your favorite whole grain to serve for dinner? I'm a big fan of Quinoa and actually grew some in my allotment this year - the variety was for colder climates and it did very well. I love it mixed 50:50 with white rice and it's easy to make this way since both grains cook at the same rate. I bet you could make it with brown rice too if you just add it in a bit later in the cooking process. I got pretty lucky a few years ago, actually, in regards to the better and more, well. Whole foods (grains and more) my family HAS to eat. Diagnosed with celiac three years ago, and other than the occasional odd strong belief I'd (for the 5min until I ride out the craving) likely be willing to risk kicking a nun if it means I could have a slice of "real" pizza - discovering all sorts of new foods has been kinda fun. Lots of millet (pretty good swap for couscous), buckwheat groats, Irish Oats (favorite) and brown rice routinely hit the plate. Jenna, great gluten-free options! My sister (who used to live with me) is also gluten-intolerant. Because millet is so small, it also cooks super fast and is a great fast whole grain option! I've never tried making buckwheat groats (just used buckwheat flour). We do the whole wheat pasta and brown rice. Interesting re the gluten free stuff. We are doing a GF trial with my one of my kids so I may give the millet and buckwheat a try. I love, quinoa. It is so easy to cook. We do a lot of gluten free cooking here, due to my skin allergies. Buckwheat pasta is also one of my favorites. I love the nuttier flavor of both of them and so much easier to digest. Barley is my favorite, either as pilaf or in soup. Oh, tied for favorite would have to be wild rice. We also regularly have brown rice, whole wheat pastas of various shapes, millet gets added to bread dough, quinoa, buckwheat groats (kasha), wheat berries, bulger wheat (for tabouleh) and cous cous. I always make a rice cooker full of brown rice and than put extra in freezer so if need in a hurry can just pull out. Only takes 43 minutes in the cooker. Wild rice is not a last minute dish either. If you have never used it make sure you buy the pure, real stuff, not the precooked stuff added to white rice. Must do FAIR TRADE quinoa. Quinoa is trending very hard, to the point that its price is so high that traditional South American peoples for whom quinoa is a centuries if not millennia old staple cannot afford it any more.